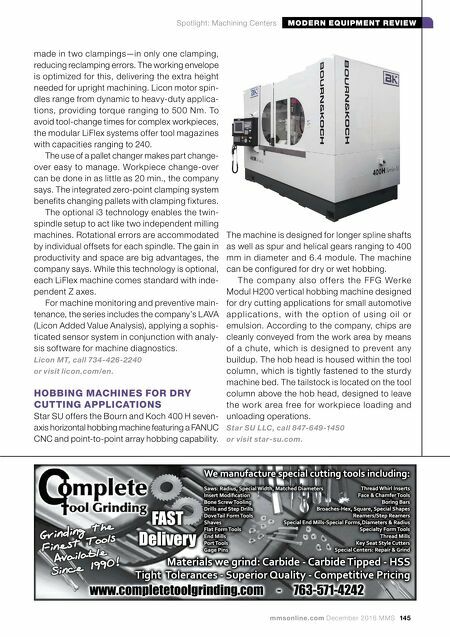 mmsonline.com December 2016 MMS 145 MODERN EQUIPMENT REVIEW Spotlight: Machining Centers made in two clampings—in only one clamping, reducing reclamping errors. The working envelope is optimized for this, delivering the extra height needed for upright machining. Licon motor spin- dles range from dynamic to heavy-duty applica- tions, providing torque ranging to 500 Nm. 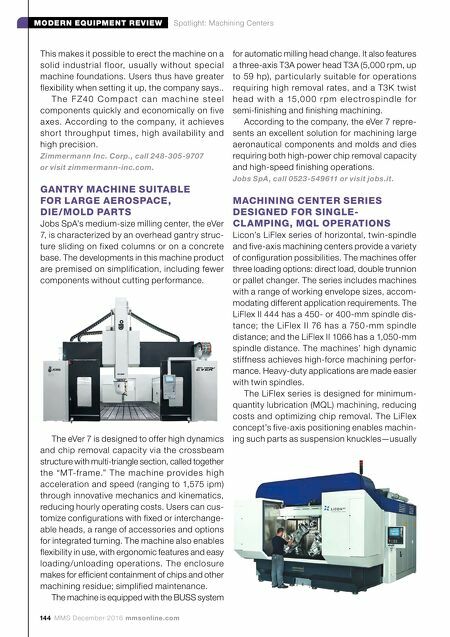 To avoid tool-change times for complex workpieces, the modular LiFlex systems offer tool magazines with capacities ranging to 240. The use of a pallet changer makes part change- over easy to manage. Workpiece change-over can be done in as little as 20 min., the company says. The integrated zero-point clamping system benefits changing pallets with clamping fixtures. The optional i3 technology enables the twin- spindle setup to act like two independent milling machines. Rotational errors are accommodated by individual offsets for each spindle. The gain in productivity and space are big advantages, the company says. While this technology is optional, each LiFlex machine comes standard with inde- pendent Z axes. For machine monitoring and preventive main- tenance, the series includes the company's LAVA (Licon Added Value Analysis), applying a sophis- ticated sensor system in conjunction with analy- sis software for machine diagnostics. Licon MT, call 734-426-2240 or visit licon.com/en. HOBBING MACHINES FOR DRY CUTTING APPLICATIONS Star SU offers the Bourn and Koch 400 H seven- axis horizontal hobbing machine featuring a FANUC CNC and point-to-point array hobbing capability. The machine is designed for longer spline shafts as well as spur and helical gears ranging to 400 mm in diameter and 6.4 module. The machine can be configured for dry or wet hobbing. T h e c o m p a ny a l s o of fe r s th e FFG We r ke Modul H200 vertical hobbing machine designed for dry cutting applications for small automotive a p p l i c ati o n s, w i th th e o pti o n of u s i n g o i l o r emulsion. According to the company, chips are cleanly conveyed from the work area by means of a chute, which is designed to prevent any buildup. The hob head is housed within the tool column, which is tightly fastened to the sturdy machine bed. The tailstock is located on the tool column above the hob head, designed to leave the work area free for workpiece loading and unloading operations. Star SU LLC, call 847-649-1450 or visit star-su.com.